Do you think you're a good singer? Yes! I've got a range like Mariah Carey, get my residency set up. I'm a little pitchy depending on the song, but over all pretty good. Me singing equates to nails on a chalkboard. I don't sing out loud. I can carry a tune but I have a definite range I need to stay in or it can turn to disaster haha. I’d say I’m somewhere between a good bad singer and a bad good singer, if that makes sense. I think I probably need music to mask imperfections, I don’t think I’d be good a capella. I smash karaoke though, because I know how to sell it and make the crowd *believe* I’m a good singer. Like strangers come up and compliment me, and I’m sure the alcohol helps😂, but I’m laughing to myself like “I’m really not that special at all.” It’s kind of weird though, I don’t think I really know what my own singing voice is, I’m more impersonating singers that I can reasonably impersonate as a poor man’s version. When I really want to wow ‘em I go with high falsetto songs😝 I’m actually pretty good at those despite having a deeper and flat voice. It's extremely rare for a man to have a 5-octave range (like Mariah), but it's the closest option. I have recorded 2 albums (not on the market). I was just trying to speak in general kind of talking. I know technicalally in music it's not a thing. When I sing, I feel like Mariah Carey in the moment, but when I record it and listen and hear myself, this video represents what I actually sound like. I dont even have a good voice why should I be a good singer? 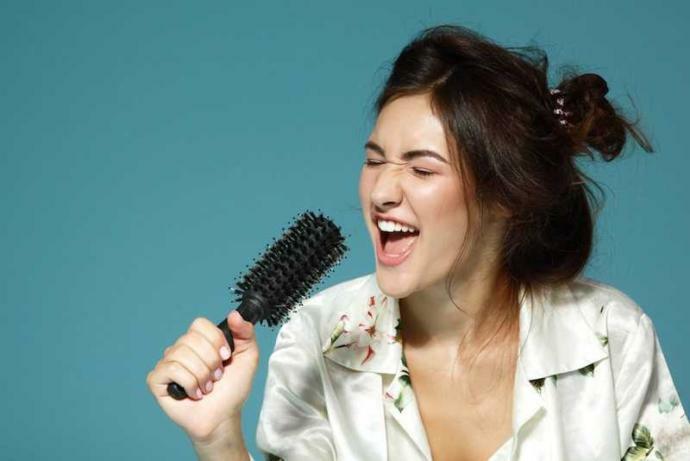 Sometimes the singing voice can be surprisingly different from the typical voice. Any good recent science-fiction movies that I could watch? How does quicksilver listen to music? Do you like dirt bike racing? Which GOT character you hope to die in the next episode? Are you going to see Frozen 2? I usually don't sing. But when I do, it's when I'm alone. I don’t sing much but I’ve been a playing music all my life, so I have a good ear for pitch. I impressed some people when I bit the bullet and signed a karaoke list, and people asked me if I’m a trained singer. Not sure if I'm good but I'm certainly a very effective singer. Whenever my wife finds a lizard or a cockroach in the house, she pumps me up to start singing. Lo and behold, within 3 minutes, all those creatures are killed. And then, my wife takes her earplugs off. Voted B. Lots of people have said that I have a good voice, but I don't have much range. I DO, but other people don't. A fine example of my wide vocal range! Had a great singing voice until I went through puberty, after that it sounds like a load of rocks in a barrel tumbler, not nice at all. I'm a terrible singer lol. But I love singing anyways because it's fun. Hell no, when I sing it sounds like a cat being strangled. I do however perform in the shower and in the car alone! I’ll only sing in my car or the shower- when alone. Not subjecting anyone to the horrors of my vocal chords. I love singing and I have been told that I have a good voice. I don't have any formal education in music but I can try and copy other singers pretty well in notes. I used to be in the H. S. Mixed Choir. I still keep up with the music, but the voice has faded a little bit since then. I do. Grew up singing in church and in my college choir. No, that's one personal delusion I don't have. I love to sing, it's just that other's don't love to hear me sing. Can't blame them. I sing sometimes when I'm anxious but not too loud im not that good lol. But it makes me feel better. I voted B. My main problem is I have a 12 year old's voice.. I'm Beyonce... in private only.. I can't carry a tune in a bucket with a lid! Which is odd, since I have perfect relative pitch. I don't sing. Because I don't want to call hell for the apocalypse. No, I'm not a good singer, I'm the best singer. You better put some respect on my title before you ask a question. Nope. I tried singing when I played in bands. It wasn't good. My singing is like a way down deep in my boots, no good in pub lick. Yes I sing pretty good. My shower is my biggest fan. Yeah that make more sense lol. No, my voice sounds like a dying bird. I couldn't sing to save my life. I know I'm a good singer. I can hold a note or two..
Haha hell no when I sing people die. Sometimes I am, sometimes I'm not. You should spread that message to more people on here! Home > Entertainment & Arts > Do you think you're a good singer?